Football In Deep Thought: Could the trip to Olympiakos be Benfica's most critical game of the season? As the final whistle blew to end Wednesday night’s “swimming” encounter between the Greek league champions and the Eagles, it was difficult to look past the deluge of water on the Luz pitch and contemplate the significance of the 1-1 draw. In understanding most football matches, perspective is symbiotic to statistics and cold hard facts, and this was no different. Olympiakos were a weaker team (on paper, at least), choosing to bench a couple of critical players (Saviola, ironically formerly of Benfica), playing away from home. Benfica fielded a strong side despite the injuries to recent potential quality signings Markovic and Fejsa. The consequence of the draw is that both teams sit on 4 points, separated by mere goal difference, in the Greek side’s favour. In 2 weeks, Benfica travel to Greece. Those 90 minutes in the Southern European nation could be the most important of Benfica’s season. 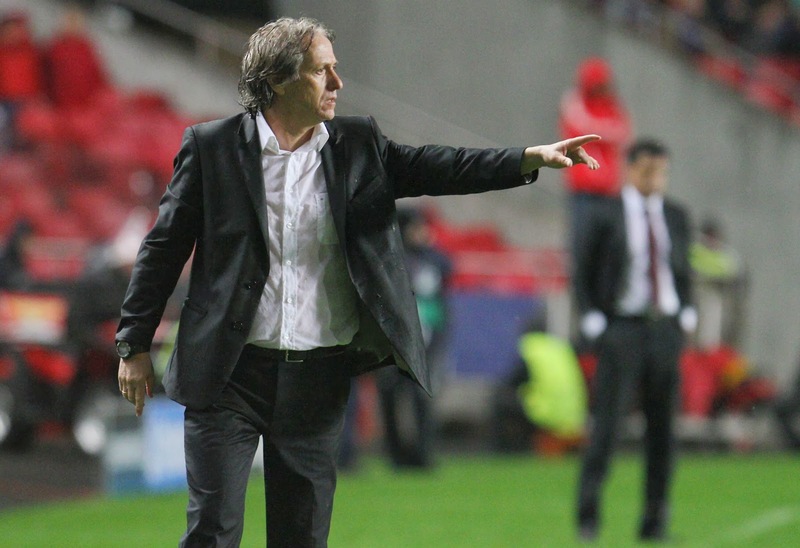 Jorge Jesus: On borrowed time? Jorge Jesus has looked under significantly more pressure this season. I’m getting ahead of myself – let’s take a step back. It’s not been a pleasant start for Benfica. I’ve already lamented the concerns raised by their pre-season in a previous piece, yet there were many reasons to be optimistic, particularly in relation to transfers. After the club signed Siqueira and Fejsa, the Eagles effectively ended the summer transfer window in a relatively unusual situation. No key players departed. The squad genuinely strengthened and substantially deeper in most positions. Siqueira’s signing was one of far more quality, one that turns left back in a potential strength for the first time since Fabio Ceontrão graced the Luz. Fejsa, Markovic, Djuricic in particular all offer tactical depth and variety that is meaningful and potent. The talents of Matic, Pérez, Garay, Gaitàn and Salvio were all retained, despite some of them being heavily linked with moves away. But from the word go, something has just looked wrong with Benfica this season. Alfredo from the excellent TalkingToDaDoll podcast summed it nicely in a recent edition of the podcast – it’s as if the nightmarish end to last season has been seamlessly continued into this season and the damaging defeats in May are still heavy in the minds of the players. Jorge Jesus isn’t his usual bombastic self – he’s appeared lost on the touchline, almost searching the pitch for ideas to change fortunes on it. The team looks disjointed mentally. Their work rates are inconsistent, only reserved for those inevitable moments of panic when the team falls behind. Every win has had its own subtext to give Benfiquistas concern – Gil Vicente, Pacos were defensively poor and made it too easy. Anderlecht were substantially weaker. Guimarães and Estoril were both wasteful and unlucky not to claim a draw. True, teams that win championships sometimes win playing poorly and are successful precisely because they grind out results when they’re needed regardless of whether they are deserved or not. But a fair number of Benfiquistas are starting to question when the team is going to find the impressive form that drove much of the promise held last season. And in the centre of it is the man with the flaming silver hair, who hasn’t managed to get it right. He seems oblivious to his best formation, his best squad. He has immense talents at his disposal, yet hasn’t been able to get the best out of most of them, the only exception arguably being Enzo Pérez. The charismatic press conferences, the confident persona seems lost; one almost gets the impression Jorge Jesus is trying to convince himself as much as his players and the fans. Benfica's participation in the Champions League is crucial for the club's revenues. Naturally, there are many routes to solving these problems, and for many fans, the decision to change the manager is considered both extreme and decisive. Some will argue Jesus deserves the time, but he doesn’t have circumstances on his side. Porto, Sporting and Braga have all changed managers. All 3 still possess – arguably – weaker 1st choice XI’s than Benfica when all players are available. All 3 have less depth in their squads. They do have their obvious stand-out superstars, but it’s clear that the expectation and pressure sits with Jorge Jesus, given these circumstances alongside Benfica’s summer spending and retention of key players. These expectations have been somewhat defined and amplified by the club’s European adventures. Benfica’s (and Portugal’s) European footprint has significantly been improved in recent years. Consistent appearances in Europe haven’t hurt the Eagles by any measure, and they’ve been somewhat unlucky to lose in recent seasons to the eventual winners of the Champions League in 2012 and Europa League in 2013. Last season’s Europa League final brought a romance not felt by Benfica and the club’s fans for over 20 years, and even though defeat was hard to swallow, it wasn’t contextually deemed a failure by many. However, as with many things, the heart sometimes gets the better of the head, and this is a prime example. Last season’s Europa League performance earned Benfica a total of €5,7 million in distributions from UEFA. It’s a figure that’s slightly understated, given that the club would have also earned gate receipts money from the 4 matches in the knockout rounds. But in comparison to the Champions League – it’s almost laughably inferior. Benfica’s EXIT from the group stage in the 2012/13 edition earned the club €13,8 million. This despite a massive missed opportunity due to finishing 3rd behind Celtic and Barcelona. Benfiquistas may choose to laugh with irony at Porto’s exit from the Champions League last season at the round of 16, but that entire campaign was worth €19,7 million – MORE than the combined figure that was earned by the Lisbon club in their adventures in both of Europe’s club competitions. For the 2013/14 season, UEFA has confirmed that Group Stage participants will collect at the very least a fee of €8,6 million. With 1 win and 1 draw, Benfica could lose their remaining matches (let's hope not!) and still, in theory, earn €10,1 million from their Group[ Stage campaign. If the Eagles make it past their group, even a round of 16 exit will earn the club an additional €3,5 million. This EXCLUDES the market pool, additional funds distributed based on the value of the TV market in each country (to give an idea, this was worth €2,2 million of Benfica’s €13,8 million earned in the Champions League last season). For a club like Benfica – this is important money. Not just to keep the club afloat. But also to pay for significant transfers. To retain key players who command the higher wages in the club. Players who often are critical not just to competing in Europe, but getting you there in the first place. Benfica's failure to win in Lisbon could have far-reaching implications. Even in a situation where Benfica finish 3rd in their Champions League group and parachute to the Europa League, it’s hardly lucrative. Excluding the market pool distributions, if the Eagles drop again to the 2nd tier competition, even if they repeat the feat and finish as finalists, the earnings would be a mere €4,5 million. Benfica’s exploits in last year’s Europa League competition haven’t gone missed either. A number of clubs across Europe are watching the club’s players, and a Champions League exit could play horridly into the hands of opportunistic clubs seeking to poach key players. Benfica have become famous more recently for having huge release clauses, but financial strains could cause the club to becoming willing to consider lower offers for players like Matic, Pérez, Garay, Gaitàn and Salvio. Predictably, it’s never the players you’d be happy to see the back of that often get linked with moves elsewhere. And someone like Matic, as an example, already has the admiration of former club Chelsea and Liverpool. Chelsea are likely to be able to offer the Serbian guaranteed Champions League football next season, while Liverpool are hopeful of their chances and could certainly afford to offer higher wages than Benfica. Losing players like this, especially in the winter window, suddenly puts an already pressured domestic campaign into sharp perspective. Benfica have grinded some results out largely by some good fortune, but the “<insert player name> get-us-out-of-jail-free" cards are likely going to run out sooner than later. It looks unlikely Benfica would not be able to sustainably survive key player departures halfway through a season. Last season’s departures of Javi Garcia and Witsel were miraculously solved by the emergence of Matic and Pérez, but there don’t seem to be the players waiting in the wings this time to step up and play at the required level should those players leave. And those players would almost certainly be tempted by the advances of other richer admirers. It’s not difficult to quantify the slippery slope after that. A Champions League exit could lead to the very transfers Benfica feared during the summer window. Those departures would all but expose the Eagles’ current flaw– if the best squad in the league (theirs) already sits 5 points adrift after nearly a quarter of the season, there isn't much hope for the progress of a weakened squad. And with Porto being annoyingly consistent and Leonardo Jardim doing a substantially better job with Sporting, there’s a clear challenge for Benfica in reaching the all important automatic Champions League qualification spot that 2nd place in the Liga offers. It will also be harder to attract quality replacements without the promise or likelihood of football in Europe’s elite competition. Olympiakos deserved their point in Lisbon. Which brings us to Olympiakos. Benfica’s trip to Greece could be season defining. Even a draw in the match ultimately hurts Benfica’s chances of progression. Olympiakos were good value for their 1-1 halftime score against PSG, and they have the benefit of a home game against Anderlecht in the final group game. The situation is unfortunately reminiscent of last season’s campaign, where despite back to back wins at home to Celtic and Spartak, Benfica went into the final game away at the Nou Camp needing a heroic win to progress – which wasn’t forthcoming. The only way this ends positively for Benfica is to protect both the points and the head to head record by winning in Greece, and then in Belgium. It’s a fair expectation that PSG will win their next 2 matches as well. That would ultimately paint a situation of PSG topping the group on 15 points, followed by Benfica on 10, and Olympiakos on 4, effectively making the final fixture between Benfica and PSG irrelevant. Even if Olympiakos produce a miracle to beat PSG, a 3 point lead and the advantage in the head to head record would keep the Eagles in pole position. If Benfica draw or lose to the Greek side, it immediately complicates the equation. Suddenly a win against PSG is the only guaranteed way to ensure qualification, unless Benfica pulls ahead on goal difference with a massive win in Belgium. Benfica need to be playing their best to beat the team from France… and that unfortunately looks unlikely at this point. An exit from the Champions League may spell the end of Jorge Jesus’ reign – but it could hurt the club in the mid-term as well. So regardless of who is manager, be it Jorge Jesus, or any appointed caretaker or permanent manager should the club choose to ultimately wave the white handkerchief – it's a must win game against Olympiakos, due to its season defining consequences. Financially, and for the retention and attraction of quality players. Granted, all the above comes with that typical disclaimer of theory. The club may still somehow survive another early Champions League exit with all their key players intact, even if it is coupled with a poor domestic campaign. However, like many Benfiquistas, I’ve gotten used to the idea of Benfica in the Champions League. Benfica is an elite club in their home territory – they should remain in Europe’s elite contest. If they don’t – new manager or not – the damage could be seriously hard to repair. Great article Marco, and some good points made. I agree entirely, JJ is totally on borrowed time at this moment and the inevitable notion is that he has taken this club as far as he is able to. The team is a shadow of last season so far, with as you mention, an even stronger squad than last year. JJ seems to have lost his huge self-confidence and swagger, and at times it seems like the players themselves have lost the confidence in his tactics. Every single player so far is performing at a lower level than last year, and of the new signings only Markovic has really impressed. One has to question the motivational ability of JJ, because this a strong and talented squad. JJ is also making more mistakes with selection again. Most agree that Markovic looks best in a free role suppourting the main striker, yet JJ only plays him on the wing. Djuricic looks like the number 10 we've really needed since Aimar started to fade, yet has been sitting on the bench mostly (where was he against Olympiakos?). And JJ continues to play his favourite player, Gaitan, in all the important matches. Gaitan is in truth, a mostly mediocre player who has little consistent influence on proceedings. He occasionally comes up with some audacious skill, but that's like 2-3 times a season, yet JJ always favours him over more in-form players. In my opinion, JJ has one chance remaining, secure a positive result in the away match in Greece. I agree that a win would be huge not only for qualification from the group but also for the confidence of the team. However I think even a draw would still put us in a pretty decent position to qualify, because after that Olympiakos face PSG away and we are away to Anderlecht. PSG will almost certainly be guaranteed group winners by the time they come to Lisboa for the last match, giving us a good chance to get 3 points there. So clearly we can't lose in Athens. If we get a draw or better, I think we are the favourites to get second place. However a loss and it's virtually adeus to the CL...and if that were the case I'd say it would be best to say adeus to JJ also (there's plenty of talented managers available out there at this moment who you feel could do a better job with this talented squad)! However this team is more than capable of getting a good result in Athens, the terrible weather the other night ruined the prospects of that match having any normality. In normal conditions, we are a stronger team than Olympiakos and we have to now go and prove it in 2 weeks time. That could just be the match that turns our season around for the better. Here's hoping....Cheers! Awesome piece as always my friend. Real, and truthful, no two ways about it, CL success is crucial, but im afraid it will just be a temporary oxygen pocket for a drowing JJ.